In the large neuroendocrine system, the islets of Langerhans belong to the third component , namely the classical endocrine glands of the human body. This endocrine parenchyma, like that of other neuroendocrine glands in the vertebrates, can be the subject of growth disturbances [25; 28]. Although a genuine aplasia of the islets of Langerhans has only exceptionally been reported in man , both hypoplastic/hyperplastic and genuinely neoplastic islet lesions do occur and form the underlying causes of several well-known clinical syndromes. The best examples of such diseases are (a) the hypoplastic condition diabetes mellitus; (b) the hyperplastic lesions in persistent neonatal hypoglycemia with hyperinsulinism and nesidioblastosis (PNHHN), and (c) the benign and malignant islet-cell neoplasms, where the hormone overproduction gives rise to a multitude of clinical syndromes . 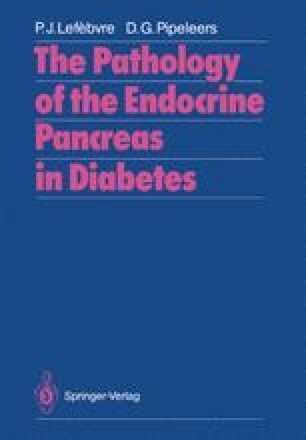 Our review will focus on the hyperplastic disturbances of growth in endocrine pancreas, notably the pathogenesis and structural lesions in PNHHN. Here, we can offer some new observations on the ploidy of the hyperplastic insulin cells, as well as an account of some recent findings on the normal pre- and postnatal differentiation and maturation of the mammalian islet parenchyma. This work was supported by grants from the Swedish Medical Research Council (Project No. 12x-718), the Swedish Diabetes Association, the Cancer Society of Stockholm, the King Gustaf V Jubilee Fund, and the Faculty of Medicine at the Karolinska Institute.